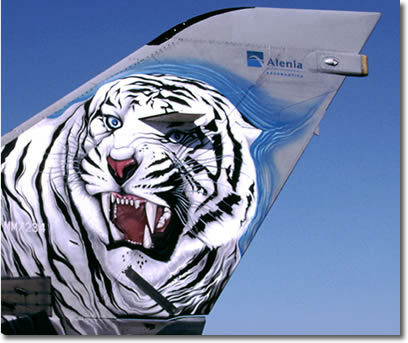 Special Tiger paint schemes are always prevalent at Tiger Meets. Here a pilot from AG-51 tries to avoid eye contact with the units Panther! 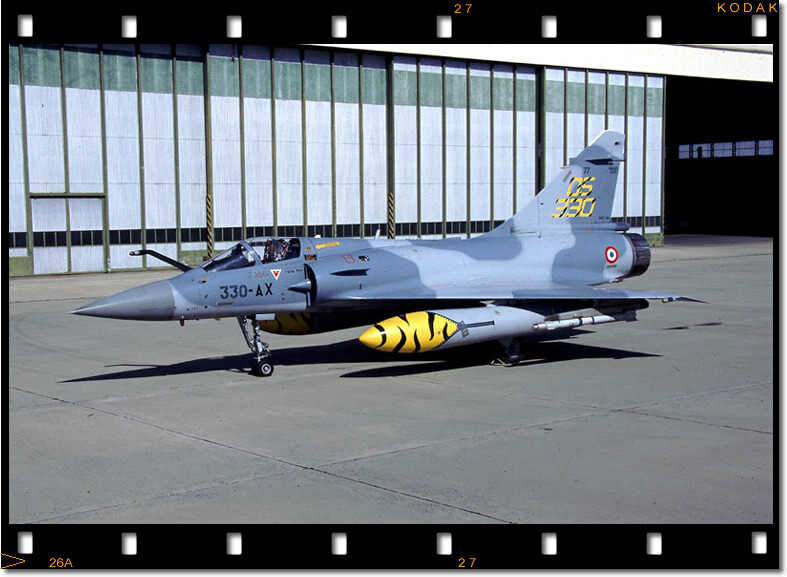 Mirage 2000-5 RDI no.77/330-AX from EC 05.330 with subtle but netherless very nice artwork. 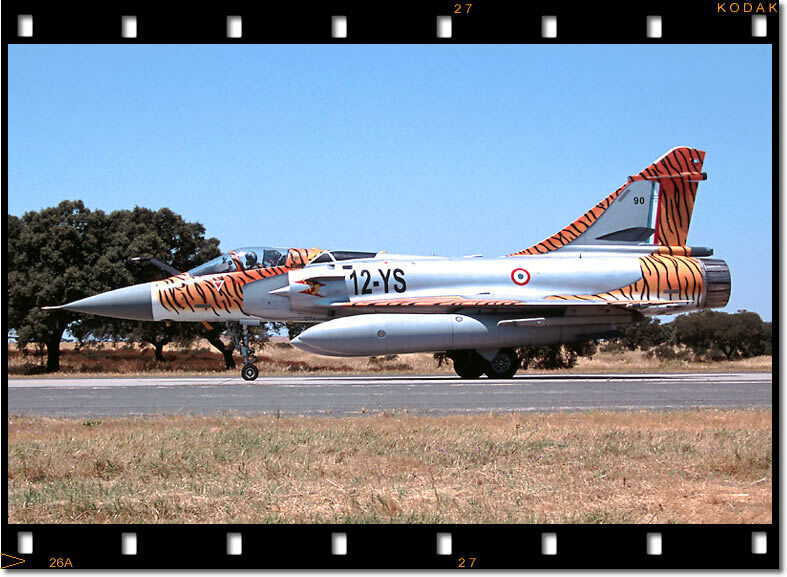 The outstanding Tiger scheme of NTM 02 has to be on this Mirage 2000C of EC 01/012 'Cambresis'. 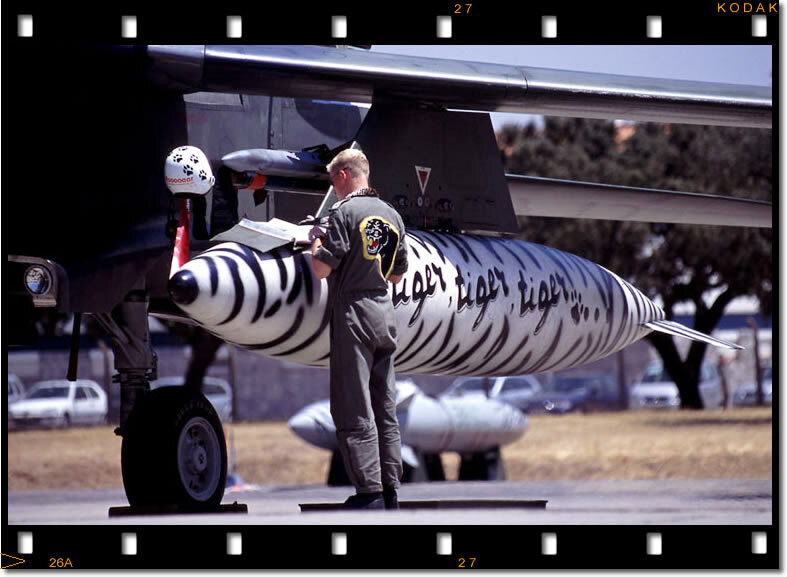 It consists of a MD450 Ouragan superimposed on a Tiger striped M-2000. 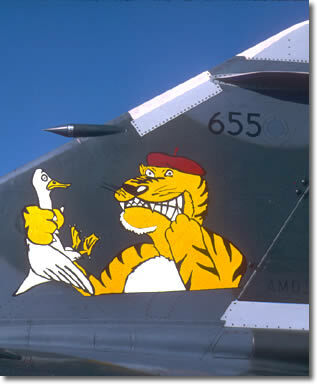 So cleverly combining the squadron's history and its Tiger tradition. The Ouragan served with the squadron in 1952. The unit won the Best Flying Award for the NTM 02. 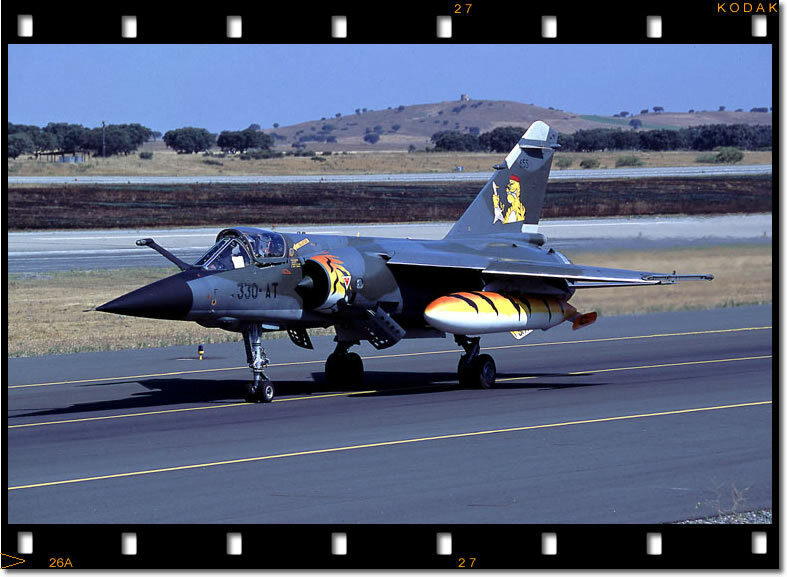 This Mirage F1CR from EC 05.330 was one of the Tiger flagships attending NTM 02. 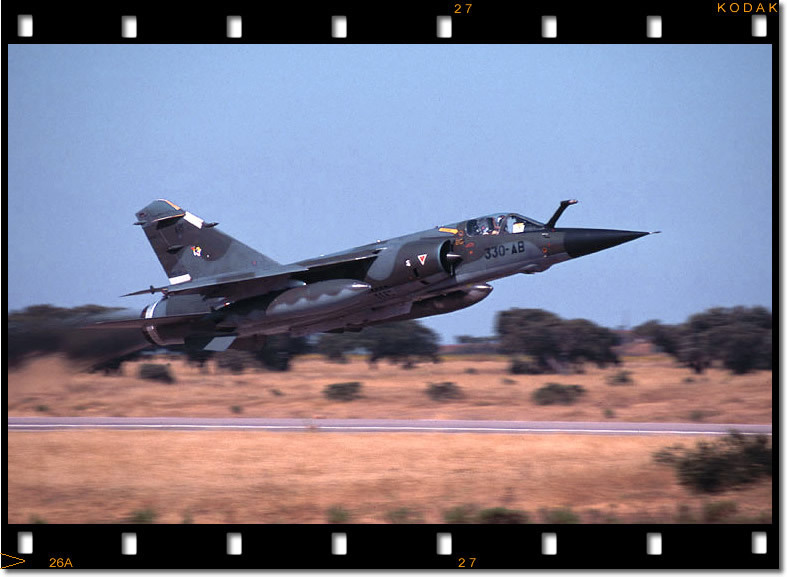 The squadron, from Mont-De-Marsan, also brought 2 Mirage 2000-5 RDI with them. EC 05.330 F1CR No. 655 heads out to the runway showing the portside Tiger tail markings. 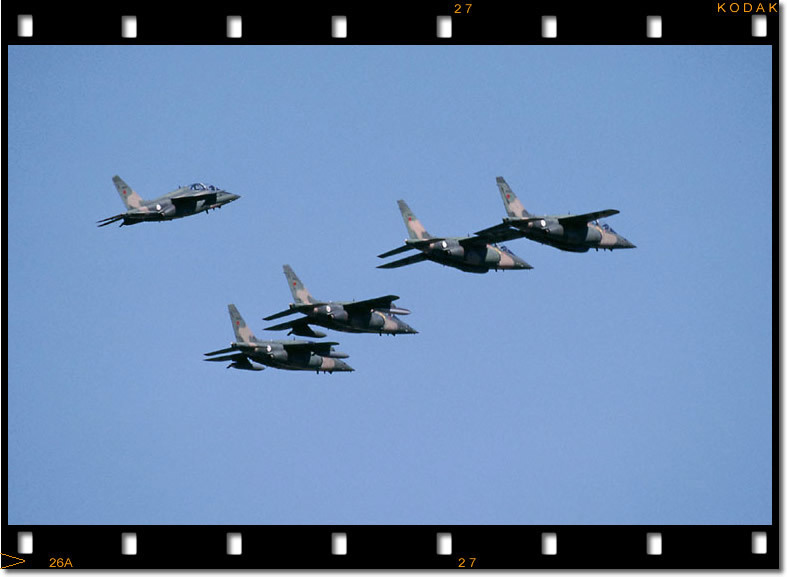 It was the first time that this squadron had brought two different Mirage types with them (F1 and 2000-5). This year the squadron was the winner of the notorious Tiger Games. Mirage F1CR 645/330-AB launches on the last COMAO mission of NTM-2002. Koninklijke Luchtmacht F-16BM from 313 Sqn taxies to the runway. One of the major benefits of a Tiger Meet is the opportunity for aircrew to experience different aircraft types and most units will bring a two seater along to give orientation flights to other NATO Tiger members. 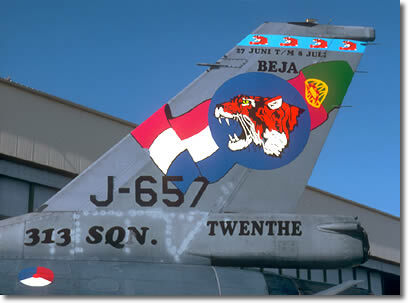 Beja Air Base - Base Aerea (BA)11 is home to the Alpha Jets of 301 Squadron 'Jaguares'. The squadron has around twelve airworthy jets on strength with a further number in reserve as attrition replacements and as a spares source. 301 Esquadra of the Forca Aerea Portuguesa (FAP) were the host squadron for NTM '02. 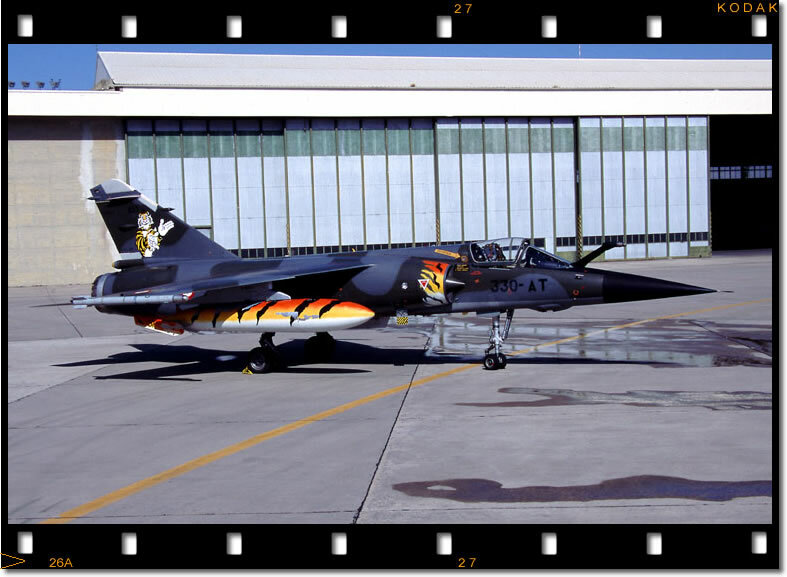 '301s 'Jaguar' flagship Alpha jet awaits the next mission alongside the squadrons Tiger car. XII Gruppo, 36 Stormo personnel work on the Blue Fox Radar on one of the units Tornado's prior to launching on the afternoons COMAO mission. 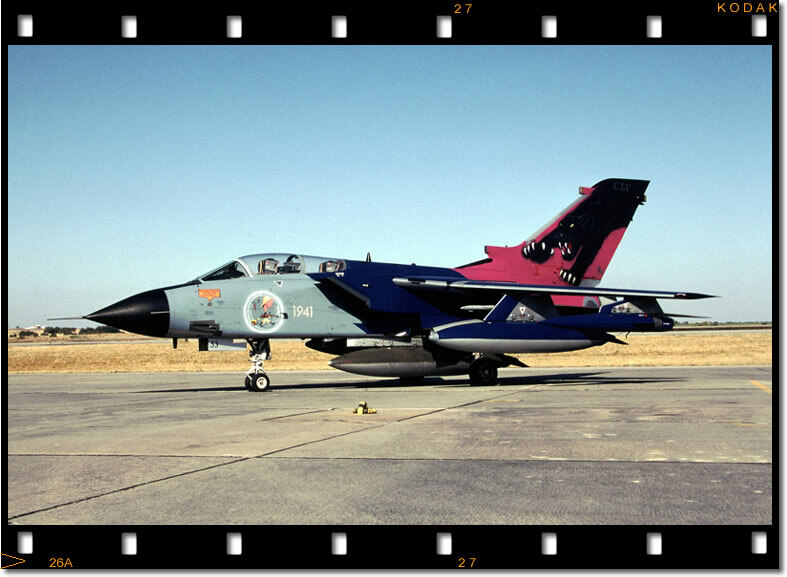 EOS-1N 35-350mm Fuji Provia The Aeronautica Militare Italiana sent four Tornado F-3s from XII Gruppo, 36 Stormo at Gioia del Colle. 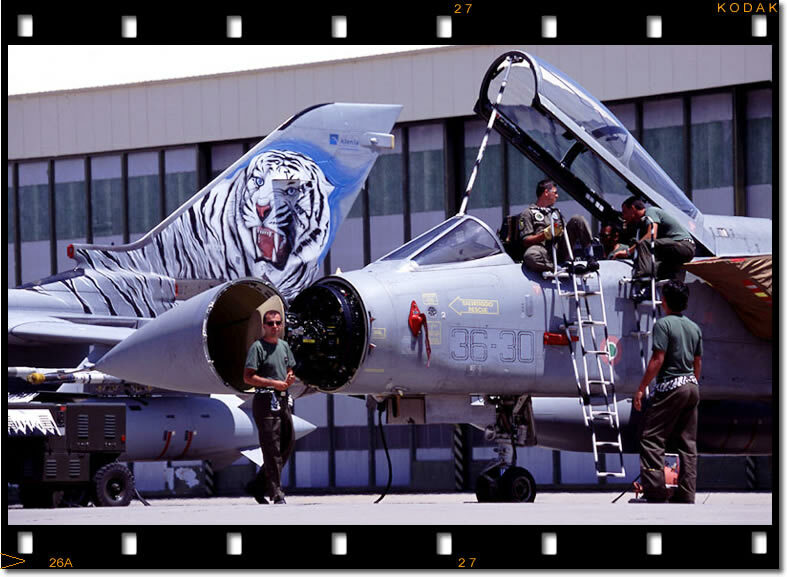 The unit has taken on the identity of 351 Flight, the old Tiger unit originally from 21 Gruppo, 53 Stormo that flew F-104s and then F-3s at Cameri. 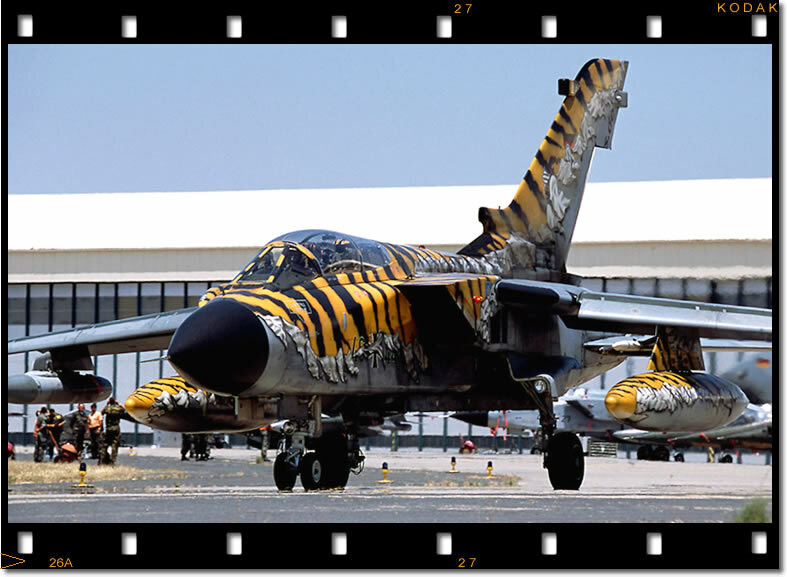 As a probationary member of the Tiger Association, 155 Gruppo, 50 Stormo brought this striking Tornado ECR from Piacenza to Beja for the final weekend of the NTM. EOS-1N 28-105mm K64 JaboG-321 has kept this elaborate Tiger scheme from last year. It is expected to remain through 2003 as well. So look out for it at Cambrai! The unit provided SEAD cover for 'Daring Eagle 02', the COMAO exercise flown in conjunction with NTM 02. 'Tiger,Tiger,Tiger!' the wing-tank of this AG-51 Tornado makes a useful desk for completing maintenance paperwork before handing the jet over to the aircrew for the upcoming COMAO sortie. EOS-1N 35-350mm K64 31 'Tiger' Squadron of the Belgian AF brought along their recently upgraded F-16AM (MLU) fighters and the COMAO exercise provided their pilots with valuable training as they work up on the F-16s new systems. 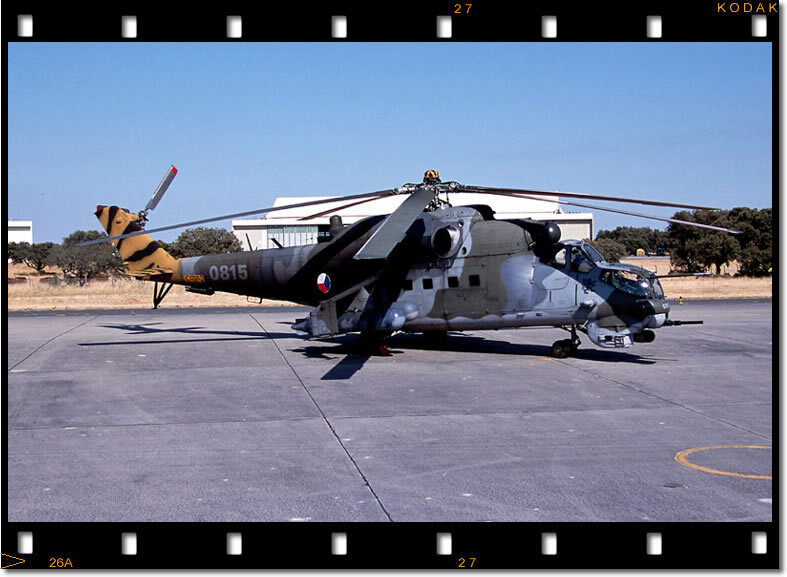 The long journey from Prerov, Czech Republic for 331 Squadron to attend the Tiger Meet with their two Mil MI-24 'Hind Vs' was rewarded with the coveted 'Silver Tiger' trophy. Awarded to the overall top Tiger unit for 2002. This is the first time the trophy has gone to a rotary wing unit in the 41 year history of the Tiger association. 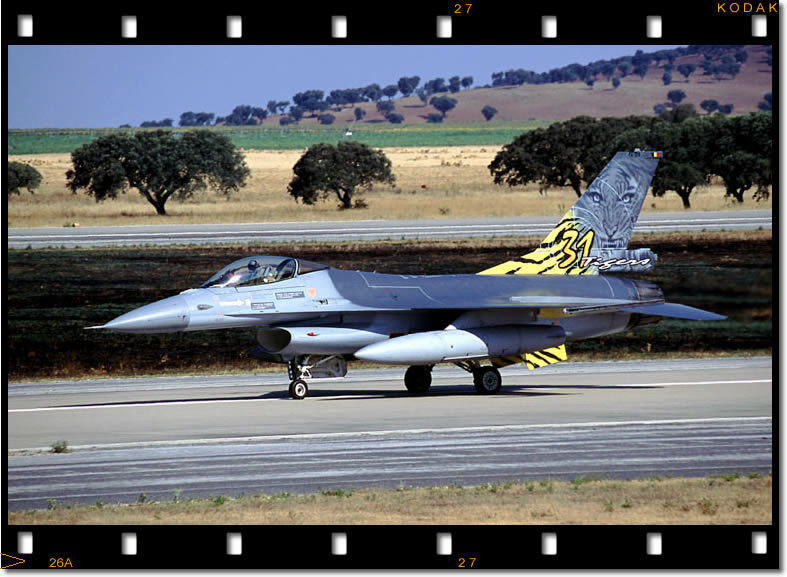 EOS-1N 28-105mm Fuji Provia B-1B 85-0066 "The Prowler" of the 37th BS/28th BW taxies to the runway at Beja. This was the first time the squadron had operated from the main Tiger Meet location thus enabling the 37th to take part fully in the flying aspects of the exercise, including briefing/debriefing. 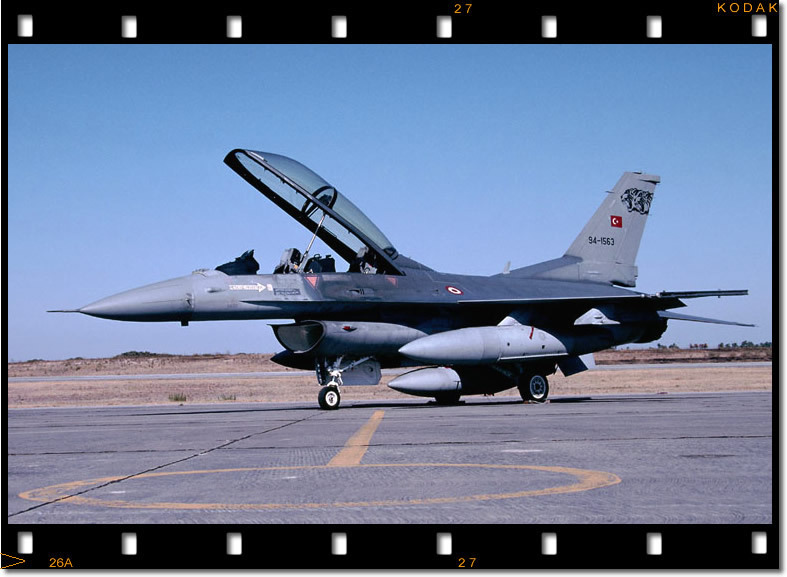 192 Filo, Turkish Air Force sent two F-16Ds to Beja for the week. Unfortunately funds were unavailable for ground support personnel to attend so the F-16s stayed on the ground. Good news is the unit will host the 2005 Tiger Meet in Turkey. EOS-1N 28-105mm K64 Esq601 'Lobos' from BA6 Montijo sent one of thier P-3P Orion's(14803) to attend the 50th Anniversary Airshow. 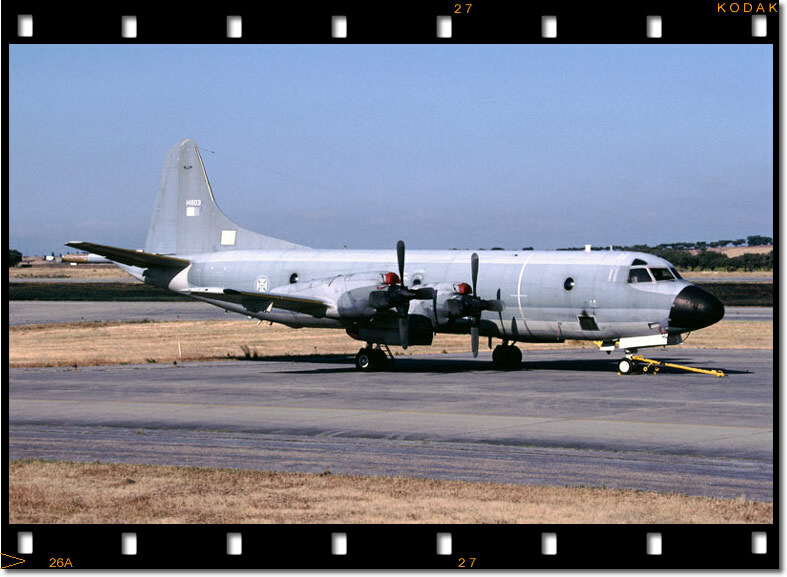 The P-3s primary mission is maritime surveillance & detection, tracking and attack of submarines and surface warships. Wow ..Gosh..Absolutely fantastic..Simply gorgeous..Shame about the three damn women in the way though!! (Only Kidding) The ladies of the Força Aerea Portuguesa enjoy the airshow and the weather during Saturdays flying display. EOS-1N 28-105mm Fuji Provia As befits a 50th Anniversary, one of each type operated by the Força Aerea Portuguesa was on display at Beja. Arriving on the Friday is Puma SA330S1 19512 , flown by the suitably named Esq 751 'Pumas'. The 'Pumas' are based at BA6 Montijo. 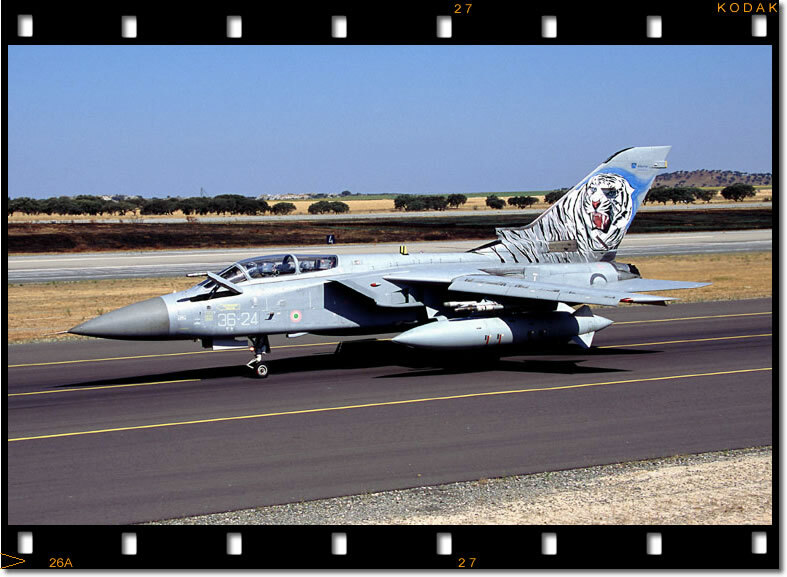 The Nato Tiger Meet [NTM] is now an established part of the military aviation calendar and for 2002 the Tiger 'Road Show' rolled into Beja, Portugal for the second time in its history. Hosted by 301 Squadron 'Jaguars' the Tiger Meet ran from June 28th until July 8th and attracted sixteen Tiger Squadrons for a week of working hard and playing hard! Sharpshooter MAJ would like to express their gratitude to Mark Attrill (NTA PR Advisor) and Capt. Paulo Concalves (HQ FAP Lisbon) for their generous help in making this feature possible. 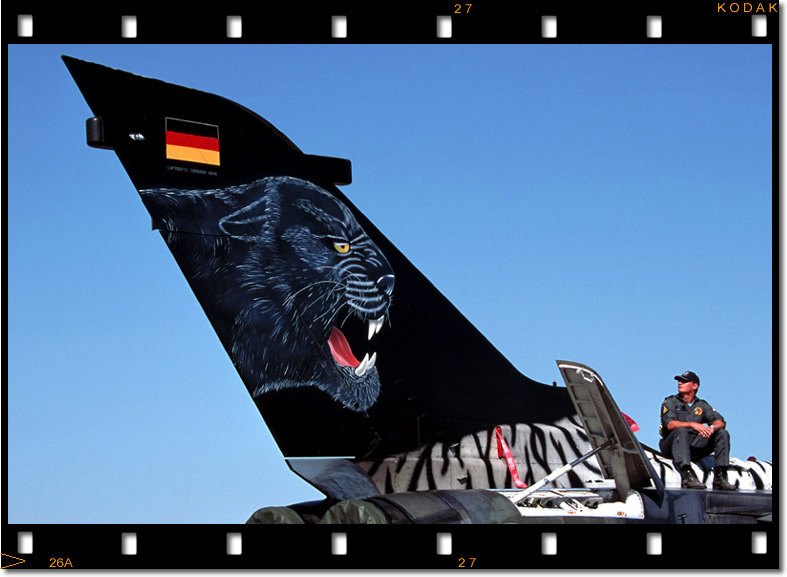 301 Squadron can trace its Tiger association back to 1977 when the German Air Force Tiger Squadron 431 nominated 301 Sqn. for membership of the Nato Tiger Association [NTA]. Both units operated the G-91R and the GAF had strong ties with the Portuguese Air Force due to basing training detachments at PAF bases including Beja. 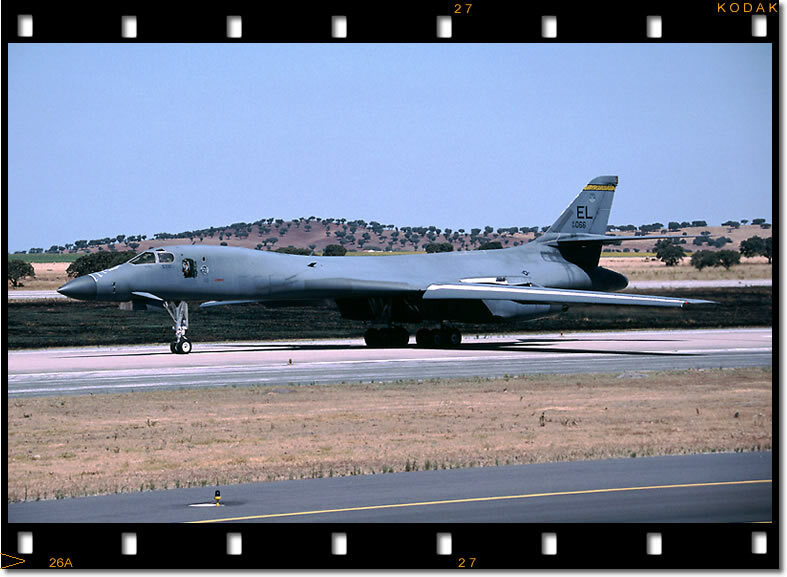 In 1978 301 Sqn. was invited by 31 Squadron, Belgian Air Force to participate in their first Tiger Meet at Kleine Brogel. Bringing four G-91Rs, four pilots and twelve maintenance personnel the Jaguars exceeded expectations and won some of the flying categories. Following this, 301 were invited into the NTA as a full member. A new Tiger was born. With a few exceptions the Jaguars have added a little Portuguese flair to Tiger Meets since 1978 and have won the coveted 'Silver Tiger' Trophy twice, in 1980 and 1985. 301 Sqn. 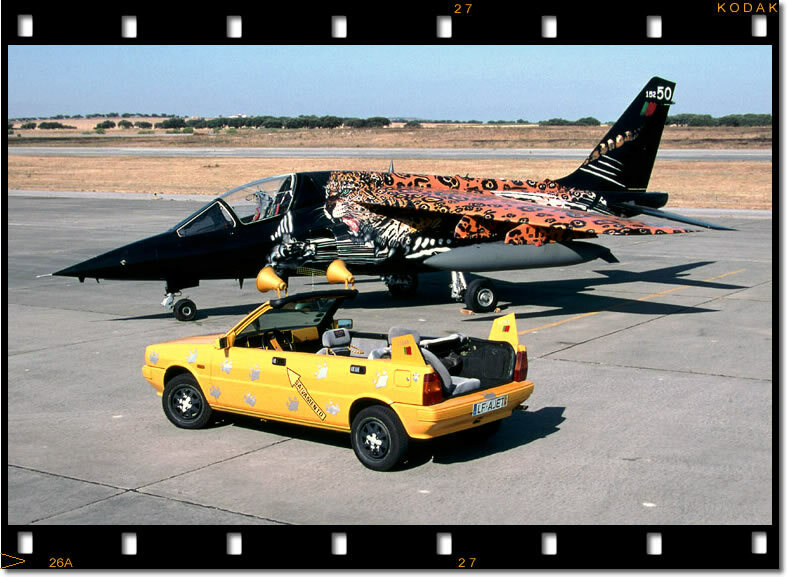 Hosted the 27th NTM at Montijo Air Base in 1987 and following conversion to the Alpha Jet and relocation to Beja Air Base they again hosted the 1996 event at Beja AB. 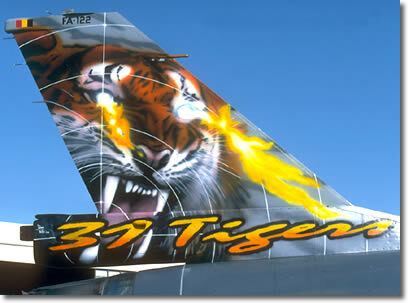 The artistic talent and expertise of the various Tiger unit's personnel are demonstrated on the tails of the participating aircraft. The many man-hours spent designing and applying the unique artwork is undertaken in their spare-time with donated funds and materials. So, to the NTM 2002 and its second visit to this huge, German built Air Base just outside the picturesque town of Beja in central Southern Portugal between Lisbon and Faro. The flying part of the Tiger Meet started with familiarization [FAM] sorties over the weekend of June 29th/30th and a full Nato COMAO style exercise, Daring Eagle 02/02, over the week from Monday 1st until Thursday 4th July. 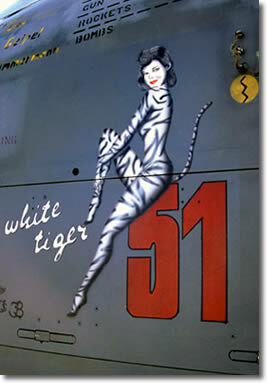 The Tiger Squadrons flew north as 'Blue Air' and were tasked with attacking targets over an imaginary border. This area was protected by 'Red Air' consisting of Portuguese F-16s and a detachment of GAF F-4Fs flying from Monte Real Air Base. Go to any Tiger squadron base and you'll see a selection of cars/vans/bikes covered in Tiger stripes. Here Esq. 301 personnel 'Post-Flight' the 'Jaguares' Lancia car following a sortie out to the flight line. Attention to detail includes wheel chocks, 'remove before flight' (or driving?) door handle tags and an anti-static line placed into the grass! 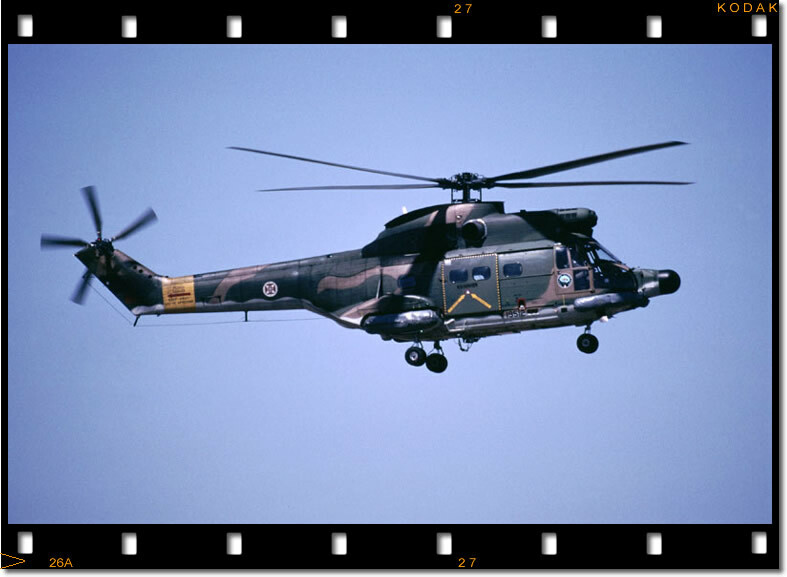 The RAFs sole Tiger unit, 230 Squadron made the long journey down from Belfast, Northern Ireland with a single Puma HC-1. The squadron is also actively trying to associate itself and the NTA with the Born Free Foundation in order to promote the charities aims of helping wildlife, including the same big cats that all of the squadrons use as a mascot. 230 invited two of the Foundations key people along to sample their first Tiger Meet over the final weekend. Saturday July 6th saw the NTM to a close with the final flag lowering ceremonies and the awarding of the various prizes to the winning squadrons. 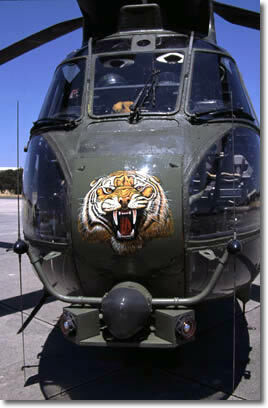 The Silver Tiger trophy for overall 'Tiger Spirit' at the NTM 2002 went to 331 Squadron, Czech AF. Best Flying Squadron award went to EC 01.012 'Cambresis', French Air Force. Like the Silver Tiger, this award is voted on by all the participants and takes account of the quality of the preparations of the missions, their execution as well as the availability and professionalism of mechanics. EC 05.330 'Côte D'Argent' won the Tiger Games. Also congratulations to Gert Weckx, friend of Sharpshooters and Webmaster of www.natotigers.org which has now been voted by the NTA as the 'Official' Tigers website. 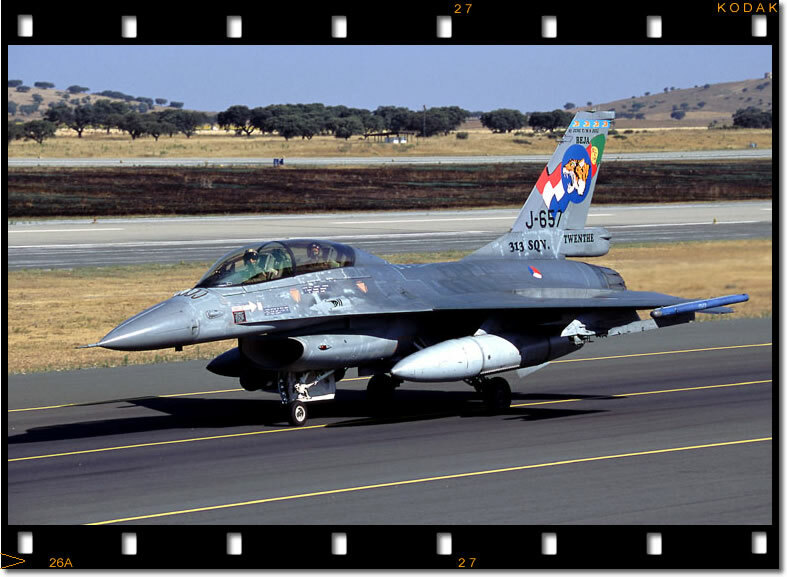 In order to maximize the opportunity of having many colourful Nato aircraft in situ the Portuguese AF planned their 50th anniversary air show for the final weekend of the NTM. This made for a colourful and varied static display over the weekend of 6th/7th July and included a fly past by a selection of the Tiger squadron's aircraft and a solo by a B-1B of the 37th BS.